I hit the jackpot this past November while visiting friends in southern Vermont for the Thanksgiving holiday. On “Black Friday”, my dear friend Hilary and I ventured out to visit a few local antiques shops when I stumbled upon a set of three toy cannons, graduating in size, and each with a unique inventive repair. 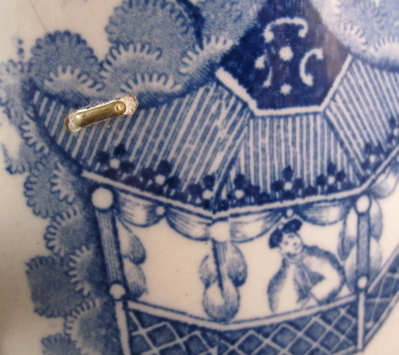 This little gem, the smallest of the three, measures 3-1/2″ long and is 1-1/2″ tall. 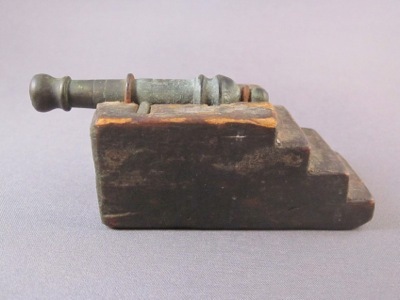 The tiny cast brass barrel, with its lovely green patina, is set in to the simple, yet effective, replacement base carved from a small block of wood, and held in place by two metal loops. 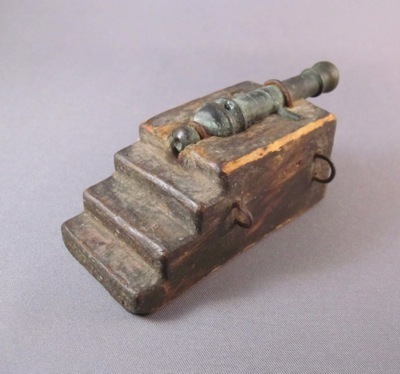 I particularly like the the three steps in the back and how the top of the wooden base was carved out in the exact shape of the cannon’s barrel so it would fit snugly in place. The dark greenish-brown painted surface remains mostly intact but shows some wear due, no doubt, to endless hours of battles played out in the safe confines of a patriotic young boy’s back yard. 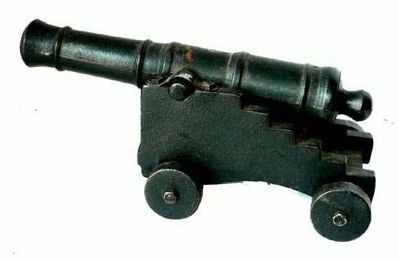 These toy cannons might have been manufactured in 1876, to help commemorate America’s centennial. I will be posting the other two cannons from the same lot in the coming months, so be on the lookout. 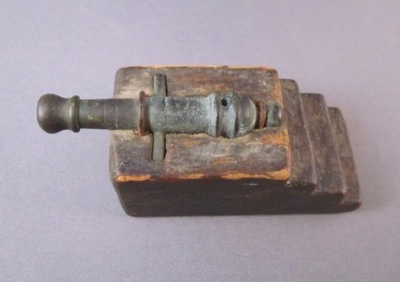 And please take a look at another small toy cannon, with a much cruder home-made repair, previously posted in these pages. 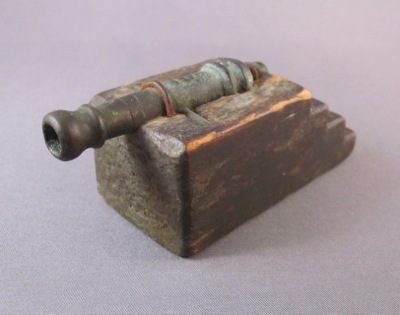 This toy cast iron ship’s signal cannon from the early 1800s shows what the original base on my cannon might have looked like. 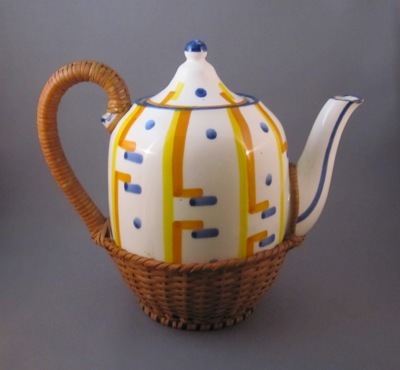 This boldly painted, hard to find teapot was designed by no other than Eva Zeisel, who worked for Majolika Fabrik in Schramberg, Germany. 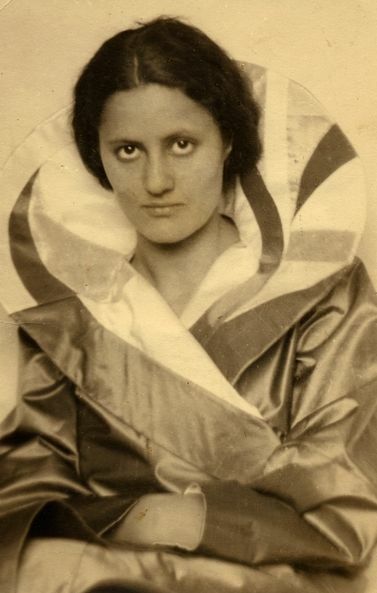 She arrived in the small Black Forest town in the fall of 1928 and left nearly two years later in the spring of 1930, creating nearly 200 brightly colored pottery objects of Art Deco inspired design. 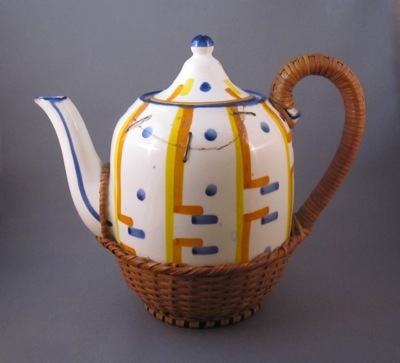 This lightweight pottery teapot measures 7-1/2″ tall and is 8-3/4″ wide from handle to spout. 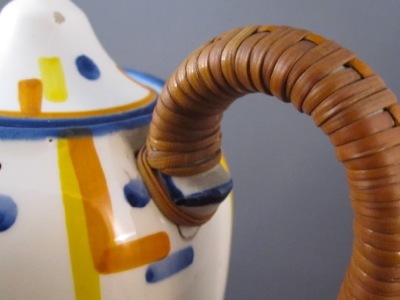 I am not surprised that this fragile teapot did not remain unscathed over the past 84 years, as the low fired clay is susceptible to breakage. 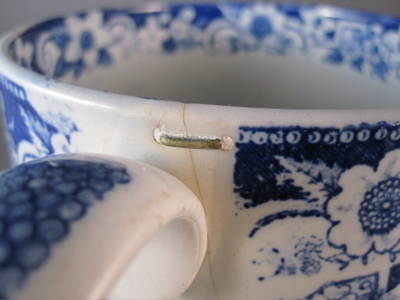 A large broken piece at the top of the pot has been reapplied, aided by three large metal staples, each measuring nearly 3/4″ long. 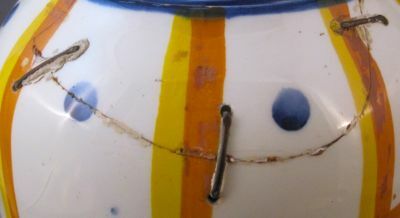 To help camouflage this none-too-subtle repair, the staples were overpainted in matching tones, with only traces of color remaining. To add insult to injury, the top portion of the handle, once broken off, has been riveted back on to the body. 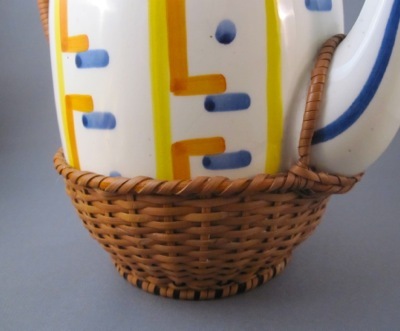 Tightly woven rattan envelopes the entire handle and the lower portion of the teapot, although I am not sure if this is was a later addition. 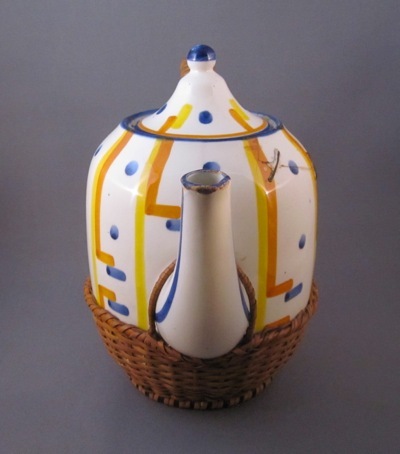 Original or not, the basket-like embellishment adds another layer of quirkiness to this most desirable vessel. 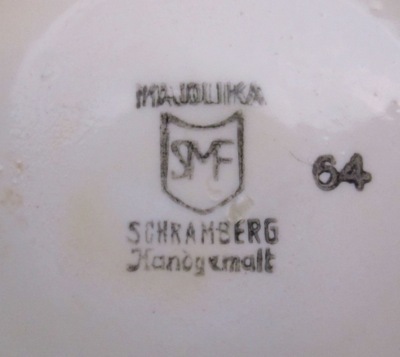 The stamped mark on the bottom reads: Majolika, SMF (contained within a shield), Schramberg Handyemalt, 64. 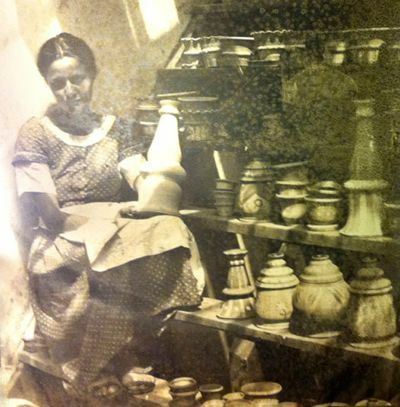 An early photograph of Eva Zeisel in her studio, c. 1930. 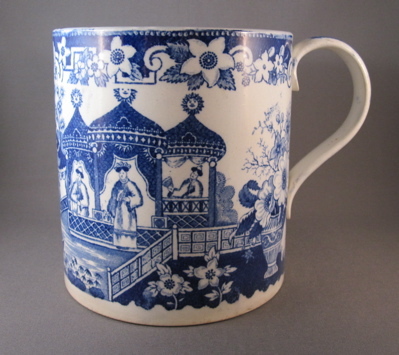 This substantial ale mug was manufactured at the turn of the 18th century, possibly by Caughley, in Shropshire, England. 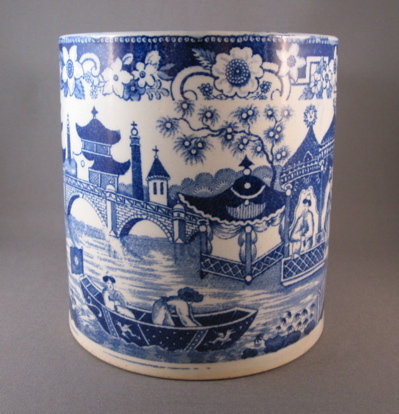 It stands 5-1/2″ tall and is made of soft-paste porcelain with a pearlware glaze, and decorated with a bold cobalt blue Chinoiserie fantasy transfer print. 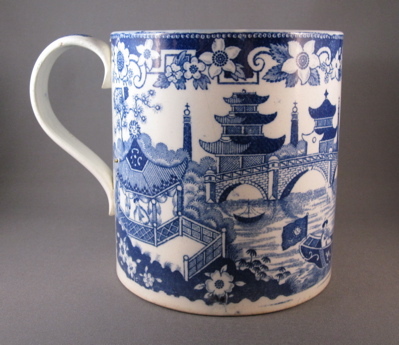 It was purchased in London by my father and given to me as my 40th birthday present. Seeing it reminds me of how proud he was when he found pieces to add to my numerous collections. Although it has just 2 small brass staples by the handle and not an over abundance of obvious repairs, as more typically seen in these pages, I am still very happy to own it. 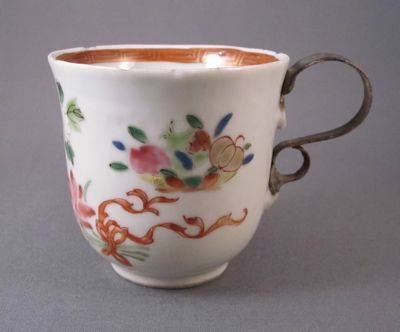 This Chinese porcelain coffee cup was made during the Qianlong period (1736-1795) for export to North America and Europe. 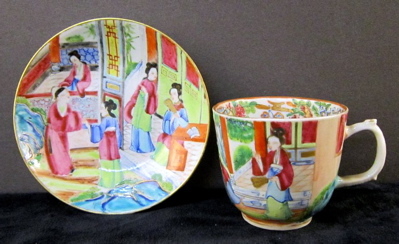 It has polychrome enamel decoration in the Famille Rose palette and an inner rim with an iron red band and gilt Greek key detailing. 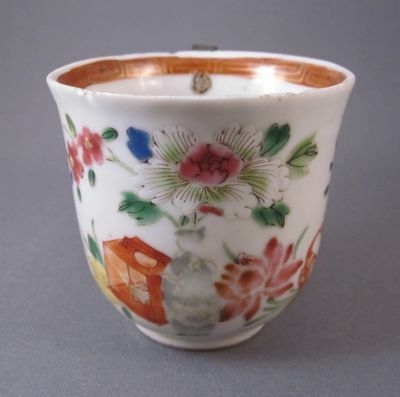 The decoration on the front of the cup shows a vase holding flowers and a box containing what looks like a teapot or an incense burner. 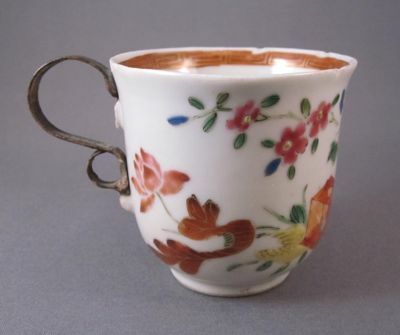 Cup is unsigned and stands 2-1/2″ high, with an opening of 2-1/2″. 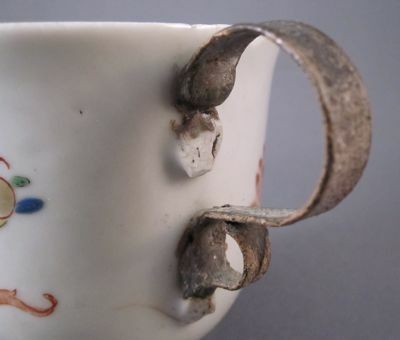 The remains of the original broken handle have been filed down but are still visible even after the addition of a replacement handle, made from a single piece of scrolled metal. 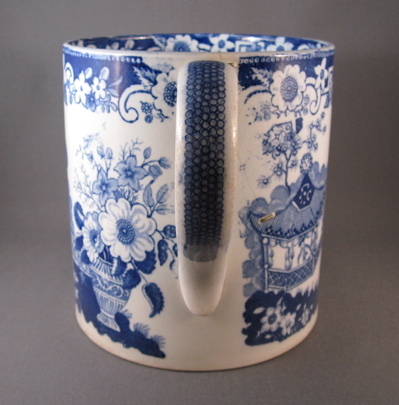 I particularly like the added flourish at the bottom of the handle. 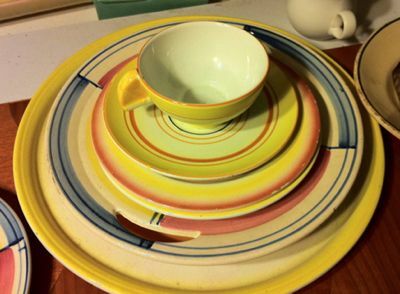 My cup would have originally had a matching saucer and a loop handle, much like the example below.